Version 3.6 is not available on serverapi.arcgisonline.com. Older versions of the API will continue to be hosted at the old URLs. Use the ArcGIS GeoEnrichment Service via the Infographic and Infographics Carousel widgets. An Infographic sample, Infographics Carousel sample and a conceptual help topic titled Working with GeoEnrichment Widgets have been added to the SDK to help you get started with these new components of the API. The histogram time slider provides a histogram showing temporal distribution of data in a layer or layers. 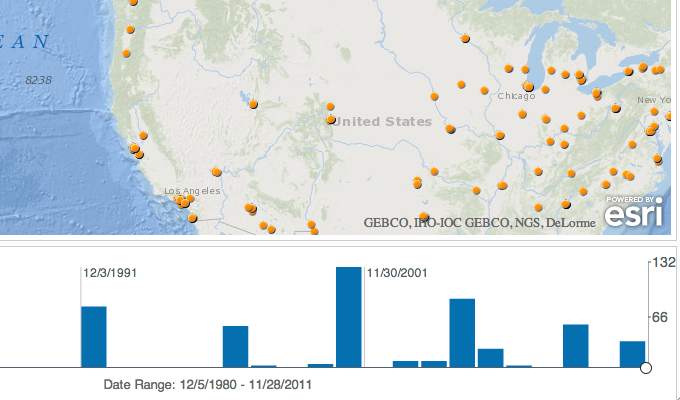 The widget is useful in exploring or filtering temporal data. Refer to the API reference for the histogram time slider or the sample that uses it for more info. The stream layer extends the feature layer to add the ability to connect to a stream of data using HTML5 WebSockets. Refer to the API reference for the steam layer or the sample showing streaming in action for more info. All classes in the API now support .on() style events. Classes in the esri/dijit folder as well as esri/toolbars folder now support .on() style events (also referred to as "evented"). With this addition, all classes in the API now support class.on() style events and this is the recommended way to write your code. Using dojo.connect or dojo/_base/connect to respond to events is still fully supported but is no longer recommended. Note that when using .on() event names have changed. Please consult the documentation for each class to find the correct name for an event. The pattern for the new names is that events are no longer prefixed with "on" and instead of being camel-cased, words in event names are all lower-case and separated by dashes. In addition to event names changing, event handler arguments have changed as well. Again, please consult the documentation for each class when using new .on() style events to confirm how to access results from various events. The pattern for event arguments is that event handlers receive a single argument, which is an object. Use propeties of the event object to access the result of an event. For instance, when listening to a map's extent-change event, access the map's new extent with event.extent. The conceptual help topic on events has also been updated with additional information for using .on() style events. All samples featured in the table of contents in the samples section have been updated to use AMD. Some samples that are available via search still use legacy style dojo.require and will not be updated. NIM092926: Editor widget: Remove dependencies on map.addLayersResult to create an editor widget. NIM092927: Overview map widget: Remove dependencies on map.onLoad in order to create an overviewmap widget. NIM093459: Resample tiledMapServiceLayer at the levels where it doesn't have data available and the service returns 404 for missing tiles. NIM093460: Edit toolbar: Creating editToolbar should not depend on map onload event. NIM093461: Attribute inspector widget: Remove the dependency for layers load when creating a new attributeInspector.